The generation of chondrocytes from human induced pluripotent stem cells (hiPSCs) may provide for the large number of cells required for the creation of novel therapies for conditions involving articular cartilage degeneration, such as arthritis; however, a standardized cell line-independent protocol for chondrogenic differentiation with high efficiency and low variability remains to be described . This problem led researchers from the laboratories of Farshid Guilak (Washington University, St. Louis, Missouri) and Charles A. Gersbach (Duke University, Durham, North Carolina, USA) to combine a rapid and highly reproducible protocol for hiPSC chondrogenesis broadly applicable across various hiPSC lines with a method to purify chondroprogenitors (CPs). In their recent STEM CELLS study , Adkar et al. report on how their newly developed step‐wise differentiation protocol in CRISPR/Cas9 engineered hiPSCs may pave the way for the development of in vitro chondrogenesis platforms for regenerative medicine as well as disease modeling and drug screening [3, 4]. The authors monitored gene expression profiles (e.g., MIXL1, MSGN1, and PARAXIS) over time as well as cartilaginous matrix production to develop an efficient month-long chondrogenic differentiation protocol that employed optimized step-wise treatment with multiple growth factors and small molecule inhibitors. During this protocol, differentiating cells passed from pluripotency and through anterior primitive streak, paraxial mesoderm, early somite, and sclerotome stages before developing into supposed CPs that generated high amounts of proteoglycan with round chondrocyte‐like cells within the matrix. While this protocol functioned robustly and reproducibly in three different well-characterized hiPSC lines, the final cell product still represents a mixture of different chondrogenic cells. Therefore, the authors modified an hiPSC line employing CRISPR/Cas9-gene editing technology to “knock-in” a green fluorescent protein reporter construct at the collagen type II α‐1 chain (COL2A1) locus in the hope of purifying committed CPs with improved chondrogenic potential. COL2A1 encodes type II collagen, an essential structural constituent of articular cartilage . 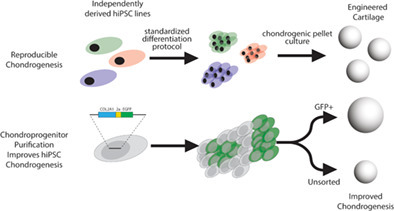 Encouragingly, a side-by-side comparison of cells derived from the new efficient differentiation protocol applied in engineered hiPSCs suggested that purified CPs, which displayed characteristics distinct from mesenchymal stem cells, produced an improved and highly homogenous articular cartilage‐like matrix without contaminating cell types when compared with unpurified differentiated cells. While the authors do note the need for assessments of in vivo osteochondral repair by purified CPs, they believe that their efficient differentiation protocol combined with CRISPR/Cas9-gene edited hiPSCs represents an exciting platform for the development of regenerative approaches for disorders such as arthritis. Indeed, the authors anticipate that the application of this new model system will encourage the identification of additional factors that will improve the chondrogenic differentiation of hiPSCs, further enhance matrix production and therapeutic outcomes, and allow the development of a more rapid, straightforward protocol for the generation of CPs without the need to genetically engineer hiPSCs. To discover all the future advances in chondrogenesis from hiPSCs and the development of novel therapies for articular cartilage degeneration, stay tuned to the Stem Cells Portal! Johnstone B, Alini M, Cucchiarini M, et al., Tissue engineering for articular cartilage repair--the state of the art. eCells & Materials 2013;25:248-67. Adkar SS, Wu C-L, Willard VP, et al., Step-Wise Chondrogenesis of Human Induced Pluripotent Stem Cells and Purification Via a Reporter Allele Generated by CRISPR-Cas9 Genome Editing. STEM CELLS 2019;37:65-76. Adkar SS, Brunger JM, Willard VP, et al., Genome Engineering for Personalized Arthritis Therapeutics. Trends in Molecular Medicine 2017;23:917-931. Craft AM, Rockel JS, Nartiss Y, et al., Generation of articular chondrocytes from human pluripotent stem cells. Nature Biotechnology 2015;33:638-45. Saito T, Yano F, Mori D, et al., Generation of Col2a1-EGFP iPS cells for monitoring chondrogenic differentiation. PLoS One 2013;8:e74137.